Frame is a simple, elegant new theme for concrete5. Based on Foundation 6 it offers a contemporary look and fe .. Fundamental is more than just a concrete5 theme; it is a powerful tool that allows you to build an entire webs ..
Multi Purpose Highly Customizable Responsive concrete5 Theme - ideal for a blog or business website. 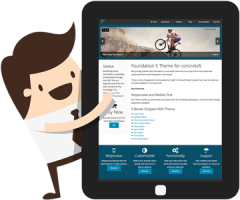 Multi Purpose, Highly Customizable & Responsive Theme for concrete5 5.7. Responsive Heart concrete5 theme from Formigo. Using concrete5? Shout about it!! Responsive theme with extensive customizable color options. FREE Social Links and Featured Content Blocks incl ..